Stealing is not a form of flattery. If someone walked into your home and took something, you wouldn't feel flattered...you'd feel robbed. or copyright infringement. Because of YOU (my friends) she received so many complaints about stealing my artwork that she finally took the image down. It's not a happy situation...but maybe her followers will know who she is...a thief. So, for the moment I feel hurt and a little wounded...but it will pass. The person who stole my artwork was selfish and wrong. What hurts the most is my emotional attachment to the piece she so selfishly took. I use artwork as a form of prayer. I painted the image shortly after my son Daniel was diagnosed with cancer (story here). The pomegranate is a symbol of life. It was my prayer to God during that difficult time...you see, the pomegranate is a sign of life in abundance. On a happy note...today my son is in remission. She can't take that joy from me! Many people have offered advice...put watermarks on my artwork, sign, date and so on. It does little to nothing to protect artwork against people who WANT to steal. The truth is it takes little skill to use a photo program to remove a signature, crop off a signature... I had an entire book scanned, translated to Persian and printed in the Middle East. My U.S. publisher had lots of lawyers but nothing could be done. When things go out into the world (more specifically out of the country) there is little to nothing we can do about it. We have NO control over dishonest people. I have two choices: Quit sharing -or- Continue to share. I choose to believe in the goodness of others. My life is enriched by the joy of creativity, sharing, inspiration, encouragement...and you. So my answer is I will continue to share. P.S. I want to thank the person who anonymously notified me that my image was taken. I'm happy you will continue to share as your work has always touched and inspired me. Your analogy is spot on. I can't count the times I've heard the flattery nonsense. Thank you for a clear, unequivocal statement. And I'm sorry you had to go through that. Judy, The analogy really stuck when I was wrestling with the emotions of feeling robbed. Hi Brenda, We met years ago in a watercolor class. 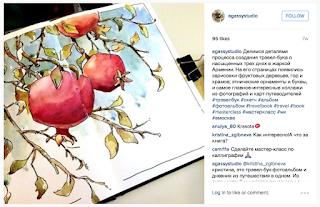 I teach fashion illustration and I had an experience with a student posting my work as hers and the outpouring of students who protested online was heartwarming. She blocked them but the universe is filled with lots of ethical people who will stand up for the truth. Your work is beautiful. Yes! The upside has been the out during of support and positive words. I went through a phase of watermarking my images. I've since given up on that. I'm not famous so I doubt this would happen to me. Sorry this happened to you Brenda. While I don't know you personally, I've come to admire you via Facebook. I do love your positive upbeat personality, and your beautiful watercolours. Elizabeth, Thank you for the positive words. It's important not to let the selfishness of one detract from the goodness of others. The world has far more good wonderful people than rotten apples. Sorry to hear of of your dilemma, but glad, you were strong and it all turned out good in the end, even though you had to suffer. Fortunately there are more good people than bad. So happy to hear that your son is in remission. keep strong and don't let this episode mar your life. Wonderful blog, Brenda! Thanks for sharing this awful experience. And thank goodness for friends far and wide who look out for us and our art. Remember that a similar thing happened in the past year to some of Jorge Royan's sketches that someone posted as his own on his website as advertisement for his work as an architect. Thanks to Jorge's many friends, the thief was forced to take down Jorge's images. Stay strong, Brenda, your work inspires many of us! I didn't know someone stole Jorge's image. I'm glad others rallied in his defense. He was far to generous of a man to not protect and honor his memory. Thanks for your in put. I think of it as a personal reflection of her...not a nations reflection. It's unfortunate that so much time, energy, money...has to be spent in our defense. It costs the thief nothing! The expense of international lawyers, investigators... would bankrupt most people. All the time policing the internet would rob we of time painting and teaching. Glad she took down your work. I complained about the theft. I think there may be another artist's painting on her page as well. 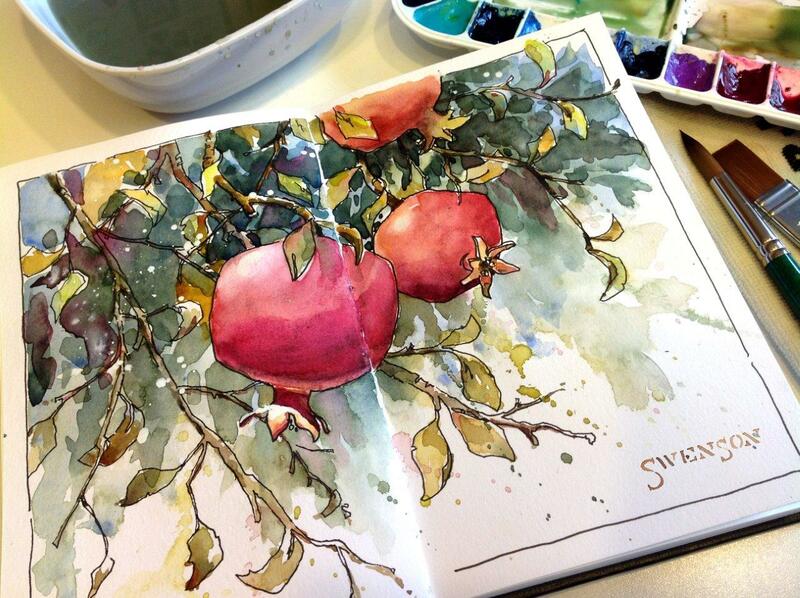 The soft watercolor looks like a Helen Strom (sp?) painting. Thank you for speaking up. On her site she claims to be a lawyer, too. She's a real piece of work! I found another image on her instagram which belongs to an etsy store account, it was of a home made travel journal. Again Ms Gassy claimed it as an example of her work/classes, no credit to the original artist. I alerted the etsy store owner who will notify instagram of the copyright infringement. Hopefully instagram will take action against her with more than one instance. Hope the pain of this violation passes quickly dear Brenda. Glad you are sharing about it! Whoever stole your picture lacks your courage and the inspiration you so graciously share with us all. Thank you! Not only was stealing your image the wrong thing to do, it just doesn't make sense. If she is offering classes, why not use an image of her own for promotion? And, if she can't create a good image, than maybe she shouldn't be offering classes! I'm sorry you had to experience this but you are right. The more we put ourselves out there (on the internet) the greater the risk at getting ripped of by some unscrupulous individual. But, what goes around, comes around and eventually she will have her turn in the bottom of the barrel. Try not to take it to heart, just consider the source and keep going forward. I enjoy your work so much and am happy that you continue to put yourself out there. Thanks. How does she looks in the mirror each day and know she's a fraud? Doesn't make sense. Brenda, awful thing to happen to you. How did you even discover that she was doing this to you? Blessings to you, Brenda. You are one classy lady and handled this well. Loved taking your class at Dillman's. I continue to say a prayer for Daniel and his family on my daily walks...am so pleased he is in remission. Hug those grandbabies! Jane, thank you for words of encouragement and prayers for Daniel. The internet has become a mishmash of people just stealing and recycling other folks' original work. Some of my high school art students debated plagiarism and copyright infringement with regard to online and intellectual properties. I always tell them that the world is waiting to see what YOU do. I'm glad this theft was nipped! So sorry you had to experience that. Cherdo, Good answer to your students. Be original! There is too much stealing and recycling. In workshops I'm often asked about copyrights. People seem to think if they change it a small percentage its okay. My answer is simple...If it's not yours don't use it. Even though its a different situation in my post...she didn't paint a copy, she took my original. Hope your getting over your terrible week! I'm glad it is finally resolved. What a crummy thing to do! It's like cutting out a piece of your heart. I'm sorry you had to experience that. It's sad, but there will always be someone ready to just take what you've worked hard for. Brenda, I am so glad you decided to go on sharing AND you did all these efforts with that person who STOLE your work of art! Persons like that are despicable! Dear Brenda, just want to say that You have a very, very big and good heart! There is no word for those people.. . I love Your artwork! And I am so glad that You still want to share Your artwork - with us who respects other people! Thank You So Much! Nina, Yes! I will continue to share. The selfish people in the world who steal for their own gain are not worth it. In the end they lose and we win! Absolutley! In Sweden we use to say "what you give is what you got" or something like that when you translate it :) I like it and it is so true! Like You said, they lose and we win! I had a similar experience a few years ago when someone stole images of my jewelry designs right off my web site, and she also stole my class titles and descriptions! She was offering to teach my classes, using my images and text to advertise them. I notified the store owners who had hired her to teach for them. They all agreed to cancel "her" classes and she got a bad reputation as a result of her behavior. I also contacted her with a brief paragraph threatening to sue. She took down my images very quickly. I also saw that she had posted a few photos of jewelry made by some artists that I recognized, and I notified the artists who then took their own action. In my case, she had stolen 11 images with accompanying text and class titles! But now she has a bad reputation in the beading and jewelry making world, and no one will hire her to teach. It's too bad that we have to do this, but I'm really glad that I took action. WOW, you really had a ordeal. But in the end she didn't prosper. Good for you! I love your words describing artwork as a form of prayer -- well said! And love the fact that Daniel is in remission (a doctor's term; I'm believing him healed in Jesus' name). Brenda - I'm SO sorry that she stole from you. And an entire BOOK??? How horrible. We LOVE everything you do & appreciate that you share your work with us. Please remember that & know that you are loved for your work. Stealing someone's art is never flattery and sadly many of us can attest to how painful it is. Most people don't know about the pending Orphan Works Bill, which would dramatically change US Copyright law. Our rights would be reduced and it would be far easier for others to use, change and even sell images without permission or payment to the artist. Few even know about this legislation and while it wasn't passed when first introduced, many think it'll be law within a year or two. Kudos for your balanced point of view. This is awful and I sympathize with you... I have not yet found mine copied but I am sure it is.. and I suspect it's foreign countries.. This is one of those things that happens and we have no control...but sure wish we did. I don't watermark, or do anything to prevent it .. Like you , I share my work and sometimes a work in progress. I follow you on other sites, and have just gotten into sketching, pen ink, watercolor etc. Hey Brenda. This kind of behaviour is really crumby! I read on Liz Steel's blog from Australia that her sketching friend discovered work she had shared online as a wall mural in a restaurant in Shanghai. Some other artists work was also part of the mural. They had just stolen the image and not bothered to ask permission, let alone pay her for the use of her work. When the restaurant was confronted, they just took it down and replaced it with something else. Liz is, like you, very generous about sharing images online. I think the solution is to continue to believe in the basic honesty of most people and keep sharing. The great thing about the internet is that these thieves antics are quickly exposed and the online community can mobilize to put pressure on unscrupulous people. The good work you do far outweighs the negatives of this kind of thing in my opinion. Here is the link to Liz's website if you want to read more about what they did. Anyway, keep on painting with an open heart, Brenda. Susan, Thank you the nice words and the positive attitude about remaining true to what creativity is all about...sharing. If we let the immoral people dictate how we should act it takes all the fun out of creativity and sharing. Thanks for sharing Liz's story. I knew what happened to her but hadn't seen her post on the incident. Liz is a great lady, artist, teacher...we've chatted on Skype. Hopefully we'll get a chance to meet and sketch together. Brenda, I am so happy you were able to get the thief to back down. This does not happen much these days. Your fans are very loyal to you and true lovers of art will always seek the truth. My son was diagnosed with cancer at age 12 and we planted pomegranate trees for each mildstone he reached through 2 1/2 years of chemo. I now have a 2 year old granddaughter with his beautiful eyes. You're right it's hard to get a thief to back down. I am grateful for fellow artists and friends who spoke out on my behalf. Thank you for sharing your son's story. Thank God for his recovery! I see the pomegranate is a powerful image to your family, too. I am late to this party...just catching up to my favorite blogs but want to thank you and others who have decided to continue sharing despite these setbacks. You cannot imagine how much you inspire creativity for your followers. Since it will be a long time before I can attend a workshop in person your demonstrations are my teachers. Thank you for helping me learn to express myself through art.